This is a different twist on traditional lasagna. 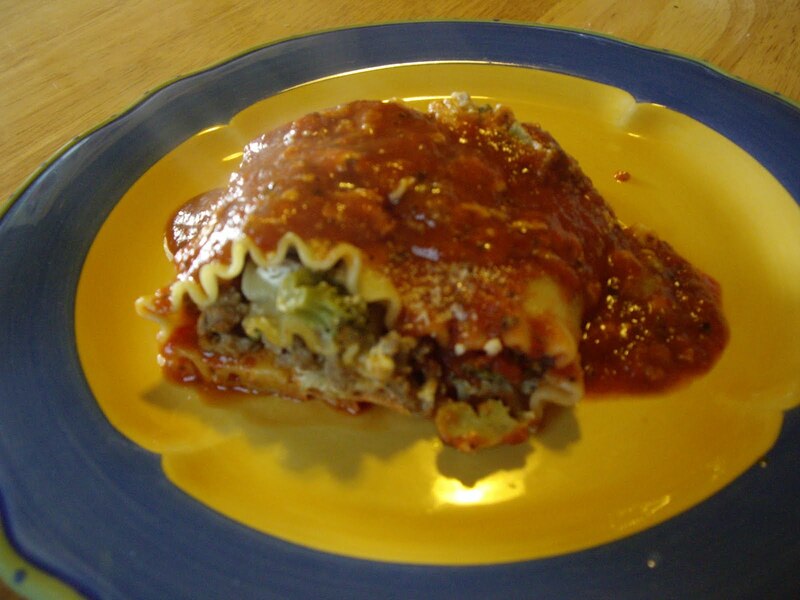 You roll a lasagna noodle around a tasty filling. You will need a large baking dish. 9×13 size works well. Cook the noodles in boiling water for 10 minutes and drain. Rinse with cold water and drain very well. You want the noodles fairly dry but still pliable. While you are cooking the noodles, cook the ground turkey and onion until the turkey is no longer pink. Drain if needed. Add the broccoli and the water. Bring to a boil, reduce heat and cover. Cook for 5 minutes. Drain. In a bowl combine the beaten egg, ricotta cheese, and thyme. Stir in the turkey and broccoli. Lay out the noodles and divide the turkey mixture evenly among them. Carefully roll up the noodles. Place each noodle, seam side down in the baking dish. Pour the spaghetti sauce over all the noodles. Cover and bake for 30 minutes. Uncover and sprinkle with the Parmesan cheese.